(EADS Astrium) – Just as its big brother, Spot 1, was deorbited in November 2003 after 18 years of loyal service, the decision was also taken to deorbit Spot 2 – in accordance with IADC (Inter Agency Space Debris Coordination Committee) guidelines on the non-proliferation of space debris. The aim is therefore for Spot 2 to re-enter the Earth’s atmosphere where it will disintegrate. Deorbitation preparations were started in 2008 by Astrium and CNES (French space agency) engineers. The satellite had to be propelled into orbits other than that in which it would ordinarily operate (822km circular orbit) and then placed into a graveyard orbit (800km apogee, 580km perigee), theoretically enabling atmospheric re-entry within 25 years. In order to achieve this, Astrium engineers first conducted detailed analyses prior to a planning and preparation phase led by CNES, in conjunction with Astrium. Deorbitation itself commenced in mid-July for a period of two weeks, with two separate phases: first, on 17 July 2009, clearing manoeuvres extracted Spot 2 from the orbit it shared with Spot 4 and Spot 5, placing it into a different circular orbit at lower altitude. A second phase then began on 20 July with a daytime burn designed to decrease the perigee as much as possible. Everything happened nominally, with a final burn on 29 July. 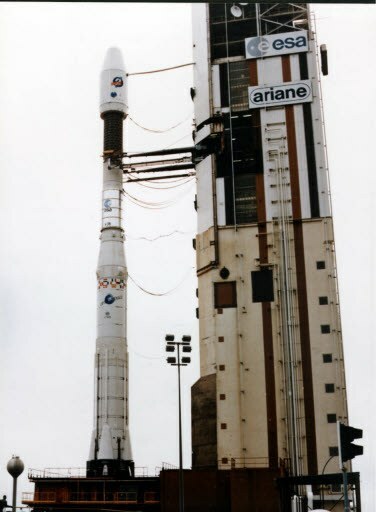 Following this the satellite was rendered passive with no fuel remaining and the TM transmitter and batteries disconnected. The orbit lowering strategy was designed in order to gain best use of the remaining fuel for the deorbitation. The gradual deceleration caused by the Earth’s atmosphere at each pass into the denser layers of the orbit’s perigee will, little by little, lead to the satellite’s altitude decreasing. Spot 2 is a true success story, having hardly ever had to rely on redundancy measures – the only exception being its back-up tape recorders – and been extensively used by Spot Image over a number of years.